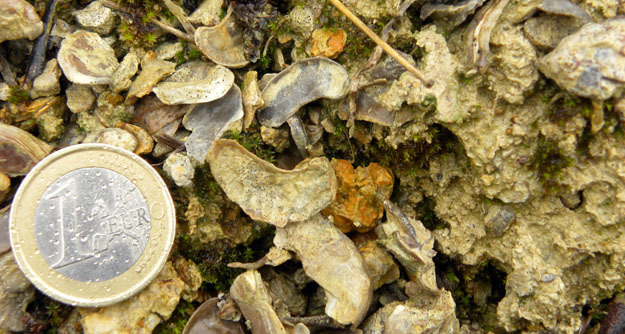 Cretaceous oysters in marly sediment near Baulny, northeastern France. VIENNE LE CHATEAU, FRANCE–To my delight, while exploring the Meuse-Argonne area this morning, I found an exposure of marly Cretaceous sediments very near where my Grandfather’s tank brigade assembled for an attack at dawn on October 4, 1918. The sediment is poorly consolidated and saturated with water, as expected. Mud again — the same mud that must have been an annoyance and danger to those nervous tank crews that October morning. 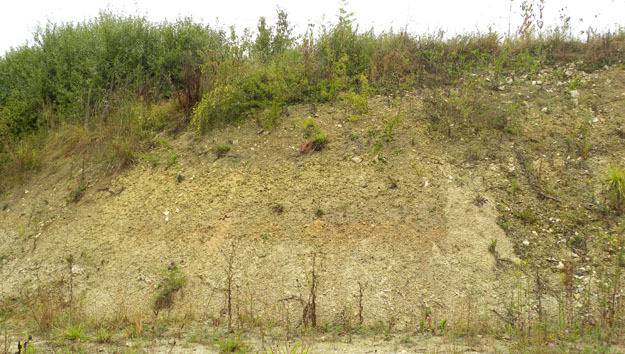 The Cretaceous marl in a roadside outcrop near Baulny, France (N49.25672°, E5.01696°). 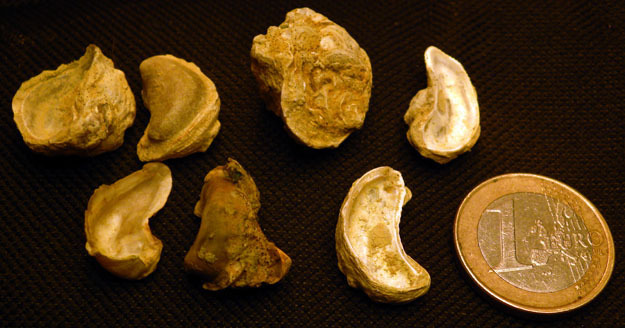 The fossils are small oysters, and they are there by the thousands. The only other species I saw were serpulid worm tubes attached to their upper valves. When found in place the oysters are articulated (both valves still in place). The facies is very similar to that of the Paleocene Clayton Formation we saw earlier this summer in Mississippi. Could Rolland Snuffer, an 18-year-old corporal from Kansas, have imagined that 92 years later one of his grandsons would be collecting fossils in this war-ravaged place? I think he would have been very pleased. His experiences here must have been horrendous. He was the gunner/commander of a two-man FT-17 Renault tank in a unit which took heavy casualties during this action. Corporal Rolland Snuffer was in Company C of the 345th Tank Battalion attached to the First Division. North is at the top. Map courtesy of Brad Posey. The village of Fléville today (from N49.30578°, E4.96945°). 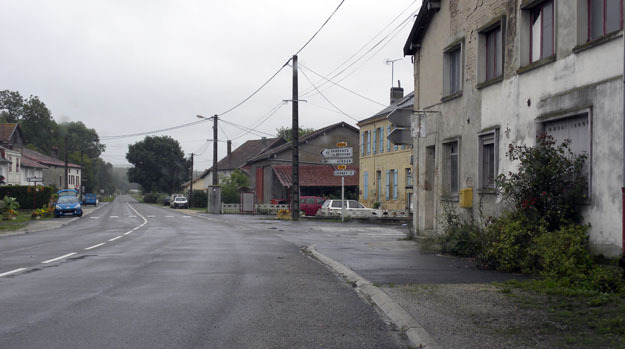 The village of Exermont then and now. 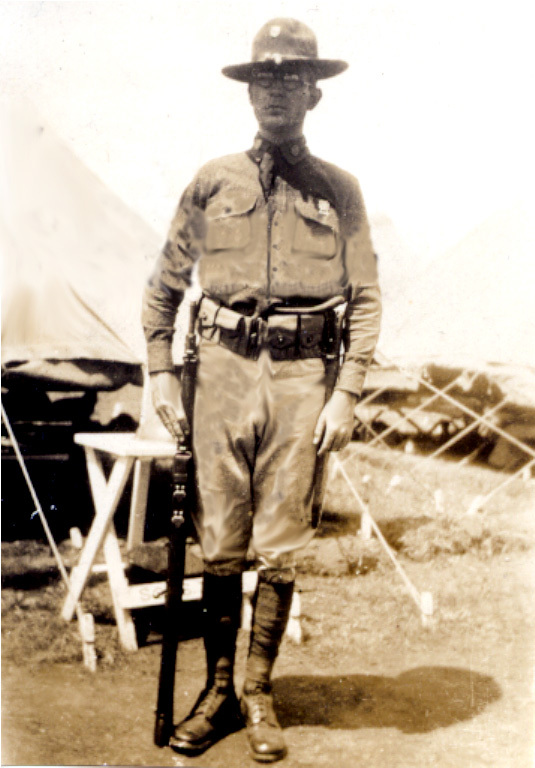 Corporal Rolland Snuffer in an undated family photograph. 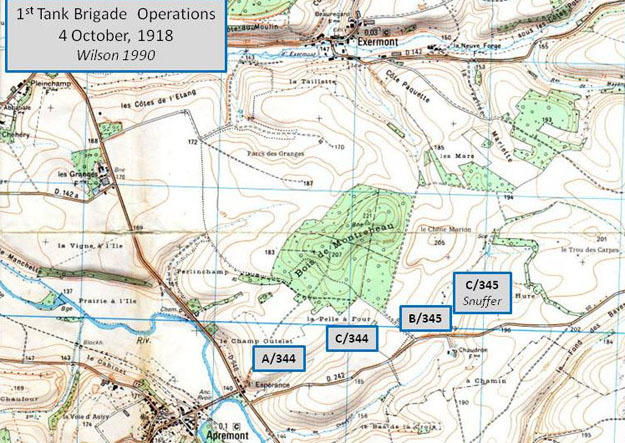 There were over 117,000 American casualties, including 26,000 dead, in the Meuse-Argonne battle, with about the same number for the Germans and another 70,000 French dead and wounded. This was the most costly battle ever fought by Americans. Our losses were far less than those suffered by our European cousins, but we still shared with them the profound effects of this war on a generation. It is hard to imagine this peaceful French countryside convulsed by war, but then it happened again 22 years later. That must have been a bitter pill for the veteran Doughboys to swallow after they survived the War to End All Wars. A book on the battle I highly recommend: To Conquer Hell by Edward G. Lengel (2008, Henry Holt and Company). Thanks for sharing this, Mark. Very interesting! This could be separated into so many different stories — the battle itself; the grandson returning to where his grandfather fought; your journey across national and language barriers to get to this place; even the geological story that you hint at. And so, a good example of how all stories are interconnected, and how stories are arbitrary decisions about when to start, when to end, and what to look at.